As I write this, Hurricane Gustav is gearing up to wreak havoc on the gulf coast. So what do we do...drive into it instead of going somewhere else. We are set to leave early Sunday morning and get to Meridian, MS, before driving the last 250 miles to Destin on Monday. Luckily we were able to book a room not to far off course from the way we would normally drive to the coast. For some reason we didn't think about booking a room 3 days ago when we knew Gustav was thinking about crashing any Labor Day parties on the G.O.M. I think as long as Gustav doesn't turn into the huge monster of a storm that Katrina did, or turn more towards the panhandle, we should be able to ride out the weather and hopefully enjoy a day or two of sunshine on the beach. Let's hope it doesn't turn into a really long trip just to go shopping. Oh dear. Only 4 days till we leave for Florida, and wouldn't you know there is another hurricane brewing. I thought we dodged a bullet since we missed Fay, but we might be in for a treat after all. Lee says, "Ride it out, baby!" but I'm not exactly loving that idea. Hopefully, in a day or two, it will die down and not make it to the Gulf. I am looking forward to a nice, warm, dry trip to the beach. Last time we were there--for our wedding--it was March, and quite brisk outside. We never even got in the water! So, please, PLEASE this time cut us some slack!! Now I think I understand why the condo was only available in September---duh, hurricanes! Cross your fingers for us....we really need a nice vacay. Ok, so I just had to share this conversation I had with Becca this morning. Go figure. She is trying hard to talk, but this isn't quite what I was going for. Lee had to work last Sunday, so I took Becca to the park. It was a nice day and the weather was perfect. Contrary to how it looks, she did enjoy the swing! Oh yeah, I almost forgot the funniest part. As we were getting ready to leave the park, a little girl about 3 walked over to the playground. Becca walked toward her, so I said "Becca, say hi to the girl." She said "hi," then promptly stuck her finger in the girl's belly button! The poor girl never said a word, just kept on eating her popsicle. I'm really not sure she could speak English or maybe she was just shocked that a strange little girl touched her--I say that's what she gets for wearing a shirt that shows her belly button! Tracy and Jonathan also came to visit last weekend. Believe it or not, this is the only picture I got! Becca just won't be still anymore so all the pictures are just a blur. But, isn't this a sweet one? She is reading her book to Uncle Jonathan. I know we have not posted in a while, so here you go. No new pictures yet, but we'll take some this week for sure. Grammy is on her way to Northwest Arkansas to spend the week with us and help out with the Boo. We have decided that Becca is going through some weird eating phase. Right now, she is a "meatatarian," meaning that she is only eating meat (and cheese, too). For some reason, she is refusing the fruits and veggies that she used to gobble up. Who knows. I guess it will pass. We are much too tired to force it. Another weird thing...we are sure that she is visibly growing in her sleep! This girl is getting SO BIG so fast! It is so wonderful to see her smiling face when she wakes up from her lovely 3 hour nap. I counted her words over the weekend. Lee and I have been a bit concerned that she's not where she should be on her vocab. But after really thinking about it and making a list, we feel much better. 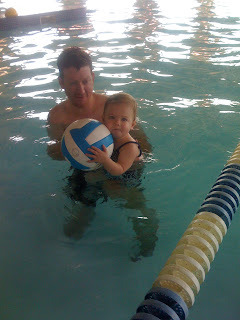 Here's the list of her words for now: Mama, Daddy, Fergie (sounds like "dee-dee"), banana ("nana"), bye, hi, baby, ball. Luckily, no dirty words....which we are very thankful for! In the body part game, she only knows mouth and belly button--so we have to get working on that. OK, so I can admit that I might have a little trouble keeping things together these days. The house is usually a wreck and there are piles of dirty laundry all over. 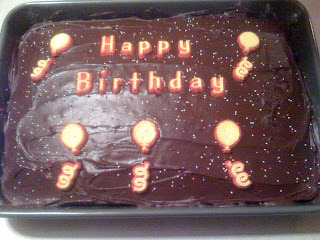 But I did manage a homemade birthday cake this year, so how 'bout that? Lee is 35 today--honey, is it OK that I tell everyone your age? Happy Birthday from your girls. 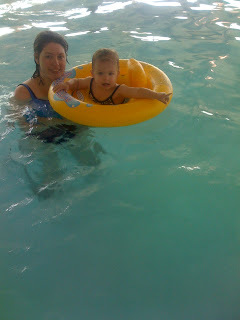 Last weekend we took Becca to the pool at the Boys & Girls Club. After our first try in KC, we were both expecting her to cry. I almost didn't get in the pool since I thought we'd just be leaving quickly. Boy, we were surprised! She did so well. Lee had to hold her awhile, but then she let us put her in the float. The only thing she didn't like was the big mushroom shaped fountain--I think it was just too noisy for her. I expect that we'll be going back to the pool often. Luckily, it's indoors so we don't have to worry about the heat or sunburns! 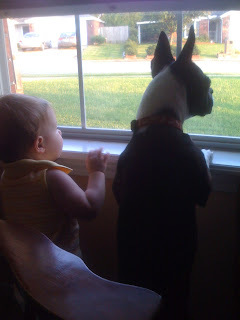 This is the scene I walked in on last night when Lee was out mowing the yard. Can you tell they are Daddy's girls? I'm sure all the neighbors got a kick out of seeing this. I just wanted to show off Becca's cute little dress that Grandma Francena got her. She wore this to church last Sunday for the first time. As you can see, she won't be still for a picture so it's an action shot.